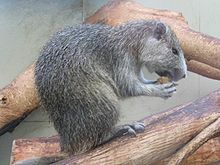 Capromys pilorides (Desmorest's Hutia), a member of subfamilia capromyinae. Capromyinae in Mammal Species of the World. This page was last edited on 18 December 2018, at 06:19.